In my very limited experience there aren’t too many art galleries that allow visitors to take pictures of the exhibits. 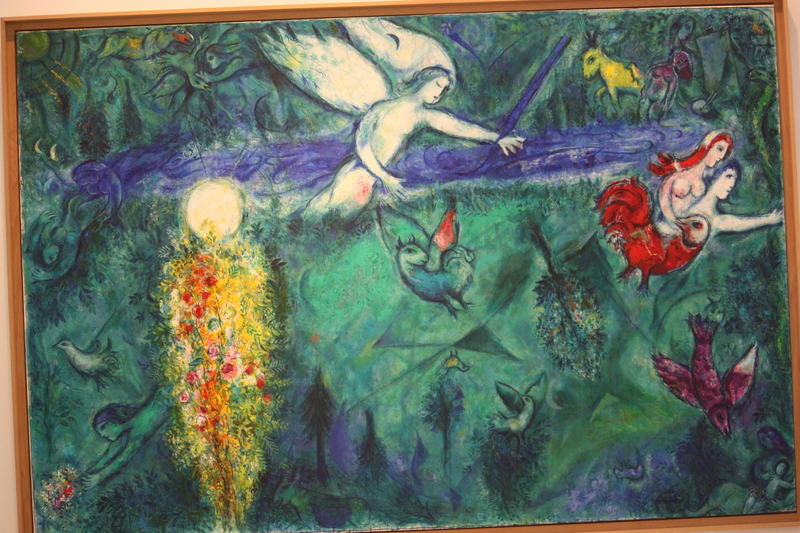 Thus exploring the Musee National Marc Chagall in Nice was particularly exciting. 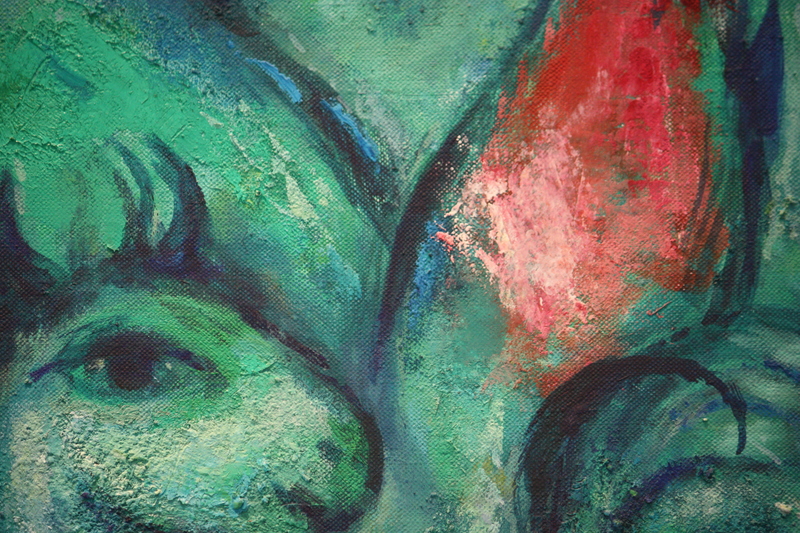 I’ve always loved his paintings – I love the colours, the textures, the ethereal and whimsical nature of his art. And to be able to photograph added so much more to the whole experience. The gallery in Nice exposes us also to other mediums he worked in – stained glass and sculpture. Set on a hillside above Nice, a short bus ride from the centre and one stop short of the famous Roland Garros tennis arena, it is surrounded by trees and quite unassuming from the outside. It was purpose built, designed by Chagall himself specifically to house his collection. All the rooms in this light, airy and minimalist space have generous proportions and interesting shapes – no one room is the same. In one room two unadorned walls have a slit window for you to gaze through at an enclosed courtyard with sculptured walls – Chagall’s work of course. 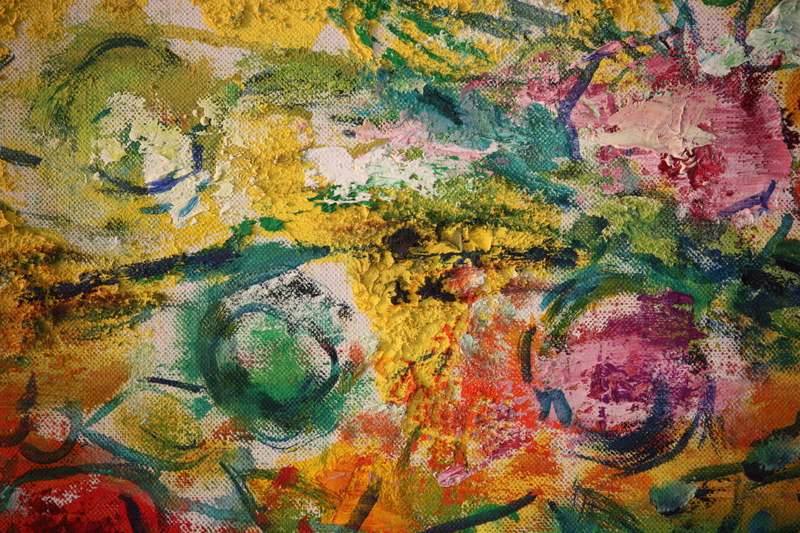 Each painting has its own wall – the paintings have room to breathe, they spring to life. There is also an 200-seat auditorium with an exterior wall in stained glass – predominantly azure blue. A 20-minute film giving further insight into Chagall’s life plays onto a huge screen. Music underlies the narration. Serenity pervades – perfect. We left, feeling an amazing sense of calm. I think somehow that by design, that was the intention. No devil in the detail here! And now – to stand back and see it all. This entry was posted in Photography, Travel, Uncategorized on August 28, 2010 by Rossi. 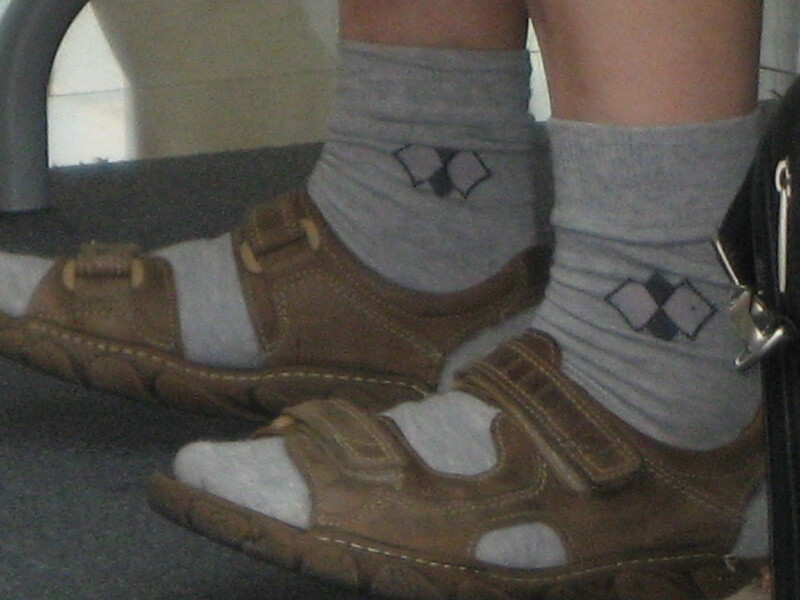 Brits wear hankies on their heads, Kiwis and Aussis wear thongs, and northern European men wear socks with sandals. We can forgive the Brits – its a ‘boys own’ sort of thing, very masculine – and they don’t have to worry about a harsh southern hemisphere sun; Kiwis and Aussis can’t be bothered doing up laces or buckles – we’ll forgive them too – it’s a macho thing. Sorry Pole, Czech, German and Dutch friends – I can’t think of any excuse for you lot. In 35 degree heat, when your feet need as little covering them as possible … why on earth do you need socks? I just don’t get it. Give those feet some air! The beauty about wearing sandals (from a mother’s perspective of course) is having no socks to wash – no searching fruitlessly through the washing basket trying to find a matching pair. I’m sure all the missing socks will be waiting for me in heaven. No holes to darn either – as if I would! No self-respecting kiwi wears socks with sandals. It’s just not done – and if it is, the hapless wearer is subjected to second glances, titters and jeers. Must be tourists! Now, this photo, with apologies for it not being as sharp as it should. I took it at Warsaw airport using my small pocket camera with the zoom zoomed as far as it would go. I just had to get a picture – surreptitiously. If we want to be picky, after all we’re talking fashion here … grey and beige together? Mixing hiking-style sandals with business socks? (If anything sport socks would be more appropriate.) And then the turned-over top edge? I think The Sartorialist would agree this fashion statement has no legs…it’s not going to be big on the runways. 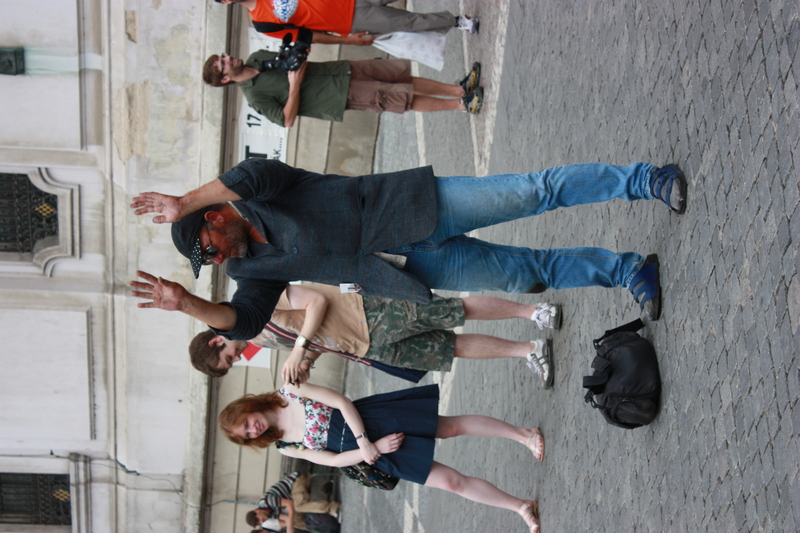 This entry was posted in Fashion, Travel on August 27, 2010 by Rossi. Humour comes in many guises. We’d taken directions to the main square from a local and found that instead of exiting the narrow alleyway into the square, we ended up back where we’d started. So my fright, while feeling confused in a foreign land, was genuine…my laugh came pretty quickly. He got me! Yes, of course the Czechs have a sense of humour. That’ll explain the multitude of shops selling puppets. Not only the traditional witches, hags and goblins, but also characters more familiar to modern audiences – Marilyn Munro, President Kennedy, James Bond, Elvis Presley and of course Michael Jackson. 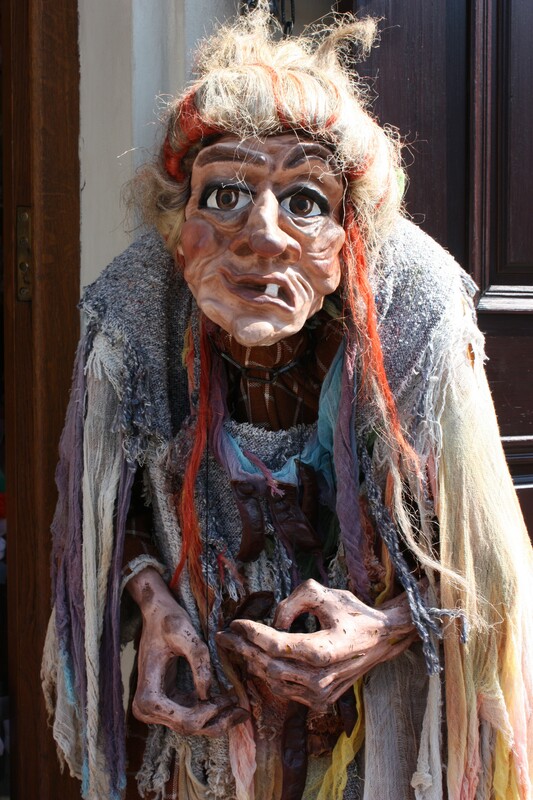 The photo above was taken outside a small Marionette shop in the shadow of the famous Charles Bridge. 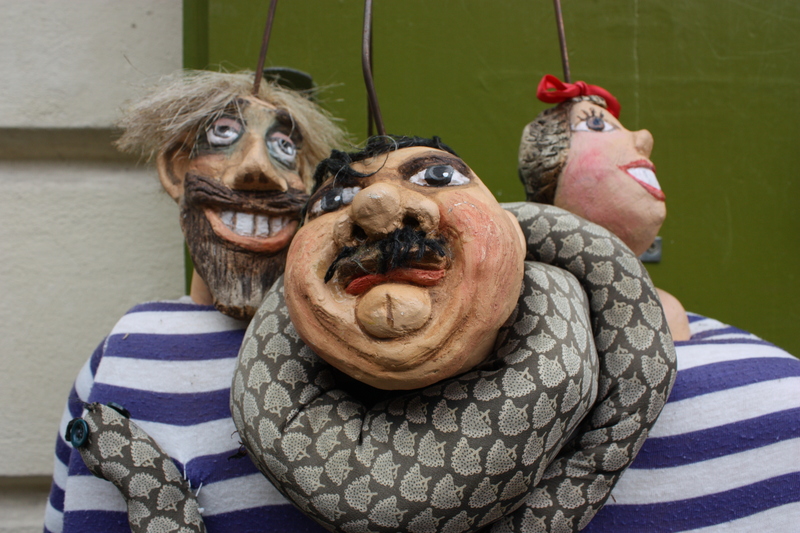 It had beautiful bright olive green doors with puppets on display outside. Inside looked like an enchanted cavern. We decided not to stop on the first day as we were on a mission to get to the old town – it was on our return route so plenty of opportunity to spend time lingering later. That’s where we were wrong. Closed due to technical difficulty! Yet again, the joke was on me. Made in my own image! Do not put off today, what you think you can do tomorrow! This entry was posted in Design, Travel, Uncategorized on August 25, 2010 by Rossi. A morbid curiosity with the dark side? Following on from our fascinating visit to the Torture Museum in the centre of the Prague’s old town, we were geared up for another dose of the macarbre. 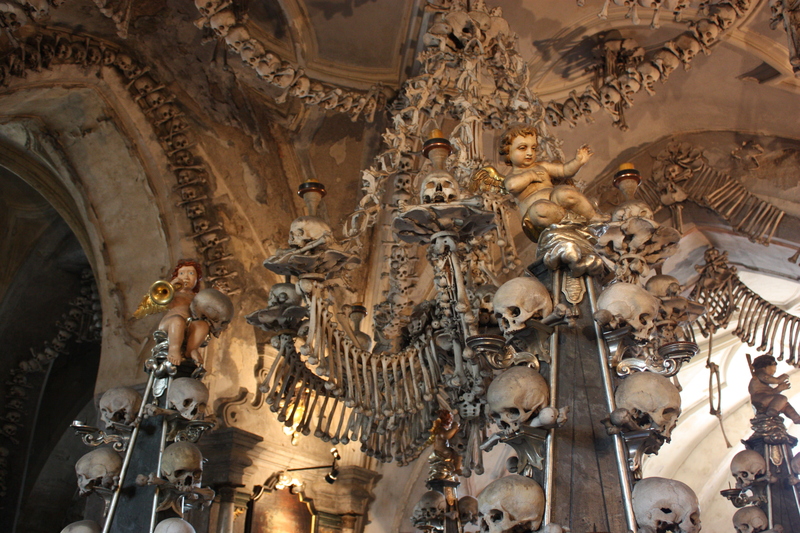 So, through our lovely hotel receptionist, we reserved seats on a trip the next day to the medieval mining town of Kutna Hora – an hour long trip from the city centre. For centuries Kutna Hora had housed and operated the Royal mint. Eager to see as much as we could in our short stay in the Czech Republic, we spent the next morning taking in the sights around the old Jewish Quarter, and only just made it back to the hotel for the 11.00am pick-up. The driver said nothing to us. He merely ushered us into the bus gruffly and then took off on a very circuitous route picking up other passengers on route to the Tour Company office – we needed to pay for our tickets. 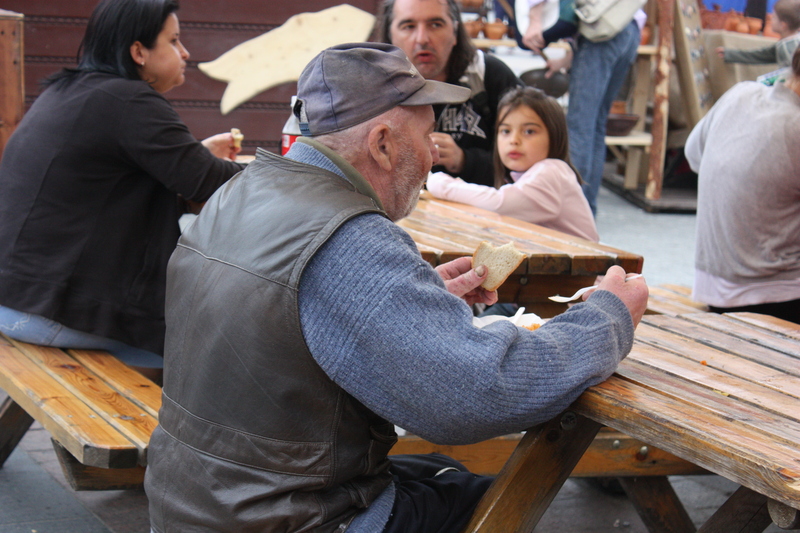 Having been told that there wouldn’t be any stops for refreshments, Ket decided to grab a hot-dog from one of the many street side stalls while I waited in line to hand over my Krona. It was a a smallish bus, with about 20 passengers, a young and attractive tour guide called Katerina and a grumpy driver. Why grumpy? It wasn’t only the body language – he wouldn’t allow Ket board the bus with her hot dog snack – didn’t want the smell, didn’t want the crumbs! So she stood on the pavement and ate while we all looked on. I was all but drooling and I suspect all our co-passengers were drooling as well. The Czechs do know how to make sausages – understatement! Finally with Ket safely back in her seat, the bus took off with everyone adjusting the air conditioning nozzles to get some cooler air in the 34+ heat. When, a bit later on, one of the other passengers unwrapped her sandwiches our bus driver leaned over to the tour guide who promptly asked her over the microphone, to put her food away! 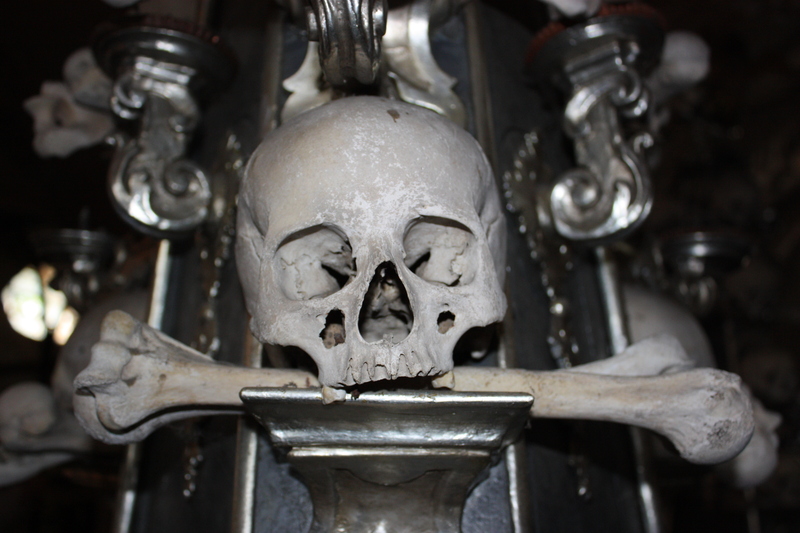 We’d heard from family back home that we had to make the trip to Kutna Hora – a UNESCO world heritage-listed town boasting amoung other things a most unusual church, the Sedlec Ossuary, its interior decorated with the remains of 40,000 human skeletons! 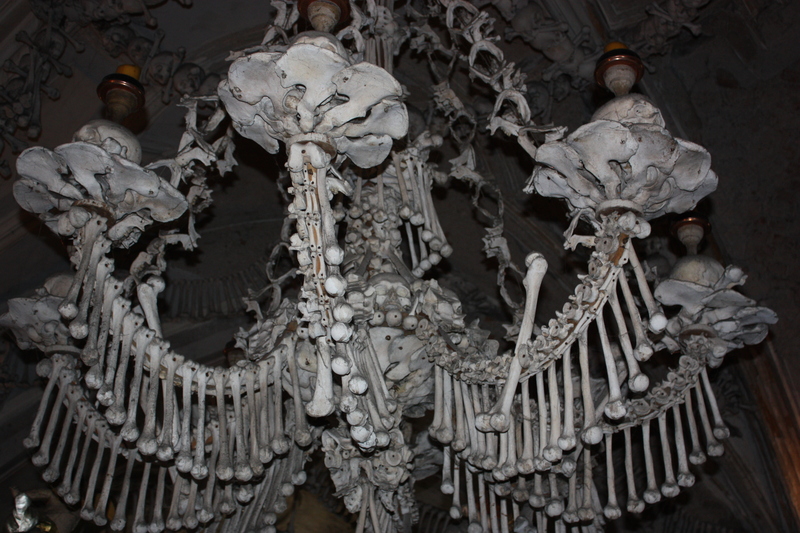 No wonder its also called the Bone Church. It is an unassuming church – its exterior giving no hint of the unusual decor within. 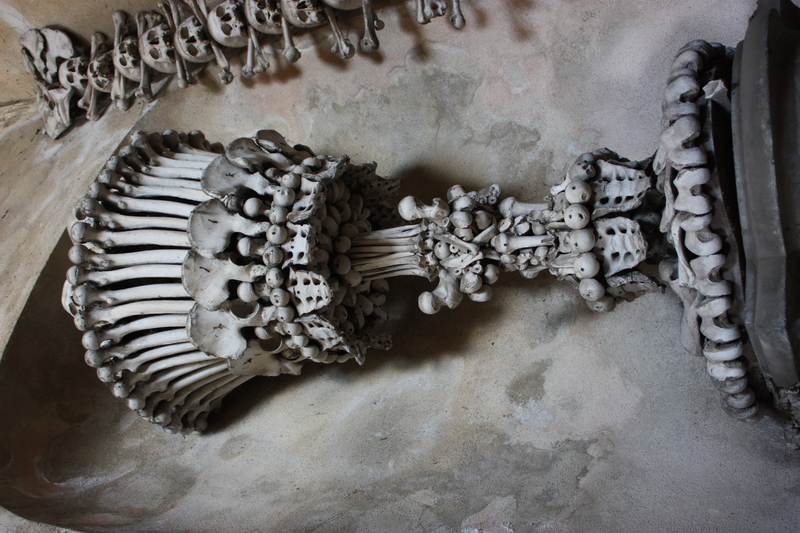 As you descend the stone stairs into the church you see all around you artistically-designed bone features – the most prominent one being the huge chandelier which apparently has one of at least every human bone. I suspect visiting medicos spend their time identifying the bodily origins. Tibea – tick – fibula – tick – rib – tick – clavicle – tick! Not so me…I was more fascinated in how Frantisek Rint (in 1870) managed to put them all together. Such a goulish sense symmetry – maybe a ‘goth’ before his time. A sense of the absurd! Not a bad idea really once you get your head around it. I wonder if they operate night tours by candlelight? The Czechs have a bizarre sense of humour - so they tell me! This entry was posted in Travel, Uncategorized on August 20, 2010 by Rossi. Since first being captivated by Lloyd-Webber’s ‘The Phantom of the Opera‘ I’ve wanted to visit the Paris Opera House. However, when I arrived in Paris recently, there was so much to see that I quite forgot about it. So, imagine my delight when we happened to find ourselves in Place de L’Opera on our walk down from the Sacre Couer. There she stood, partially swathed in tarps and scaffolding, in all her magnificent neo-Baroque glory. Nine euros seemed such a small price to pay to enter and marvel. Sadly, escorted tours were off for duration of the structural work. The Opera House, opened in 1875, is the work of Charles Garnier – think Sarah J-P advertising Garnier Nutrisse with her irritating girlie accent! There’s probably a little less emphasis on the first ‘r’. 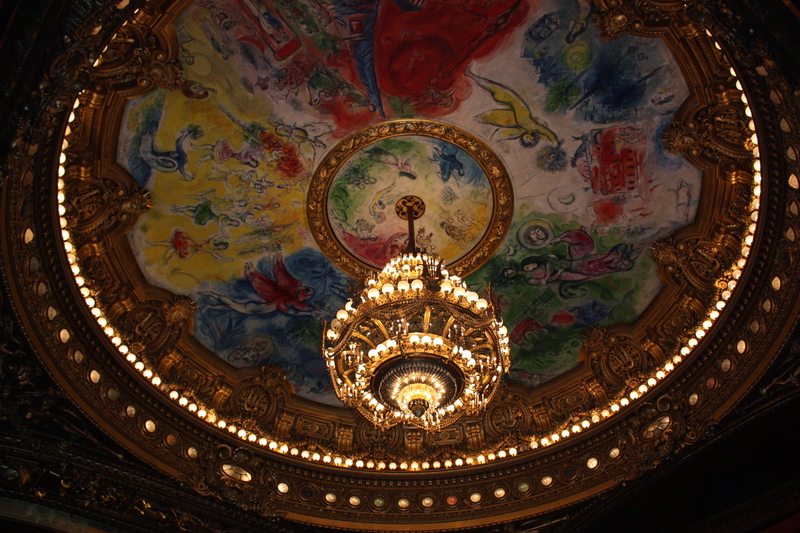 It’s also known as Palais Garnier. The first glimpse of the ornate vestibule took our breath away. A wide marble staircase curving up to the first floor with massive columns and sculptures at either side, deep mahogany doors leading to the auditorium and to the opera boxes, mirrored surfaces making it appear even bigger. A photo at every blink! A vast ballroom with exquisite parquet flooring stretched along the first floor at the front of the Opera House – its chandeliers reflected in the highly polished floor. The word magnificent doesn’t do it justice. But, as if this wasn’t enough, the best part was yet to come. The auditorium. We just had to sit and soak in the beautiful warm glow of the upholstery and the wood, the glistening of the gold paint, the opulence of the surrounding sculptures, the stage with it’s backdrop of gothic columns, and framed on either side by two-tiers of curved opera boxes. The chandelier made famous in Lloyd-Webber’s ‘Phantom’ sat centre stage. Above us, where the notorious chandelier had been – the one that inspired part of the story for the Phantom (in 1896 a faulty counterweight caused the chandelier to fall killing one unfortunate soul)- was the newest version. I’ve always had a particular love for the work of Marc Chagall – so imagine my delight when I looked up and saw his artwork surrounding the chandelier. 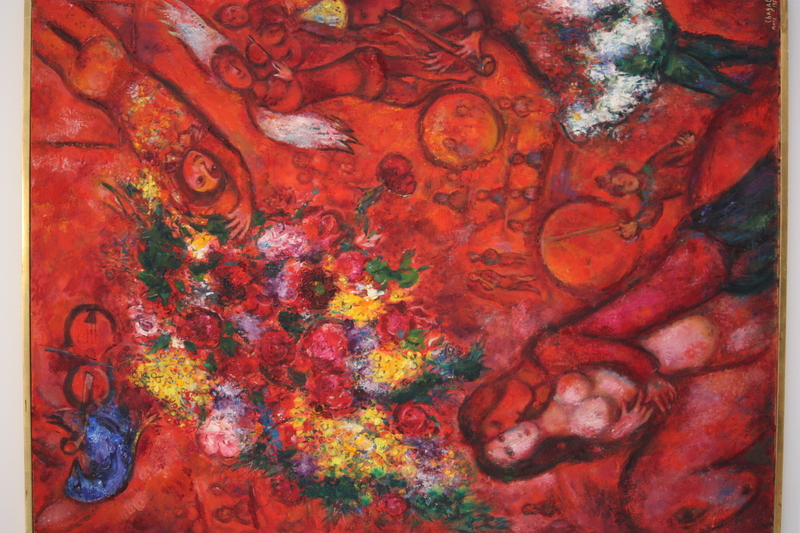 Wistful and colourful – typical Chagall and totally gorgeous! He painted the ceiling in 1964 – goodness know how he did it. Did he lie on his back as Michelangelo had done in the Sistine Chapel? A labour of love…apparently not everyone shared my view when it was first seen. 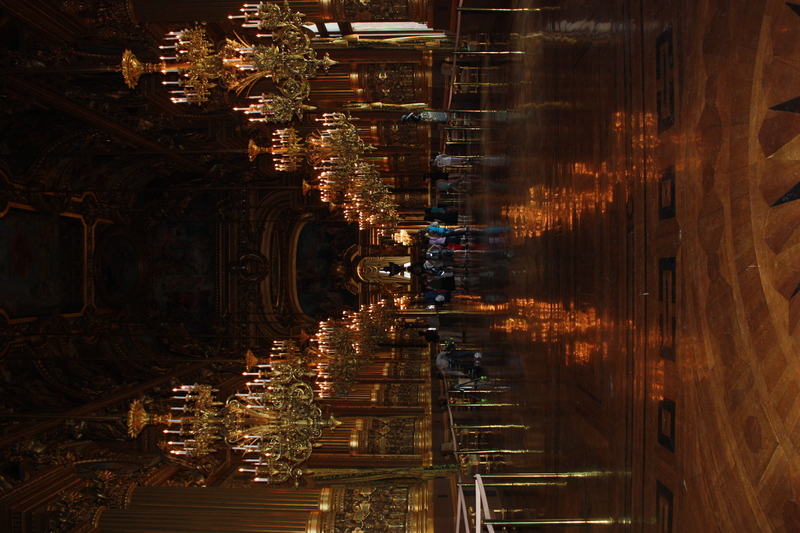 When people ask me what the highlight of our visit to Paris was – and there many – the answer is without a doubt our visit to the Paris Opera House. This entry was posted in Travel on August 16, 2010 by Rossi. 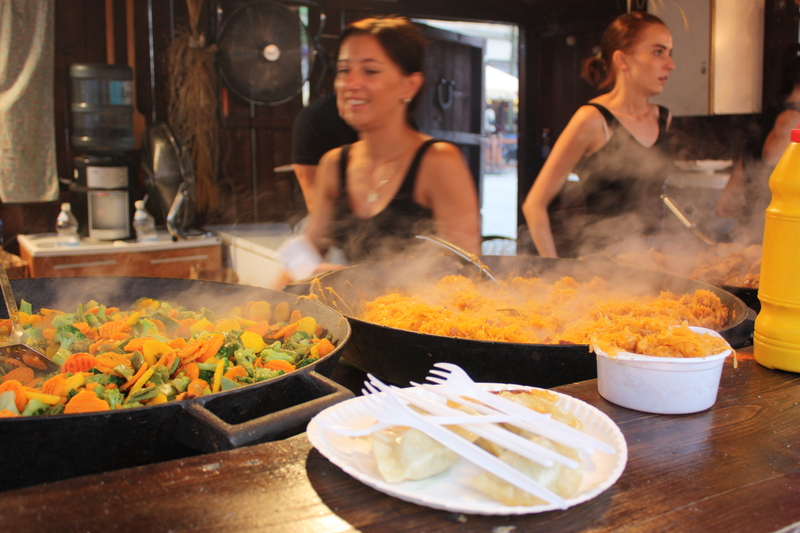 The Krakow Market was a real treat and ticked all the above boxes with humour to boot. In fact ‘ticked all the boxes’ really doesn’t do justice to the delights on offer there. The stalls were a myriad of colour – selling wooden toys, clay and enamel figurines, boiled lollies, ginger biscuits covered in candied icing, beautiful Polish crockery, artwork of all kinds, traditional Polish costume, bags, jewellery, scarves and of course food. While Ket decided on sampling a salted halloumi-type delicacy that had been cooked over an open grill and served with cranberry sauce, I decided to indulge in a rather large grilled bratwurst with rye bread and, even though I wasn’t that partial to it as a child, a small helping of bigos. (Bigos is a sort of peasant hunters concoction which uses cabbage as its base.) They would have given me a much larger helping for my zlote, but I indicated using my best possible hand gestures that I only wanted a little. Seems that there’s no such portion as ‘a little’. I thought that the real McCoy Polish version just might succeed in converting me where Mum’s had failed. It certainly looked and smelled delicious! With tomato sauce - you can take the girl out of New Zealand but not New Zealand out of the girl! I took my seat at a trestle table alongside a local family and duly began my step down memory lane with some trepidation. 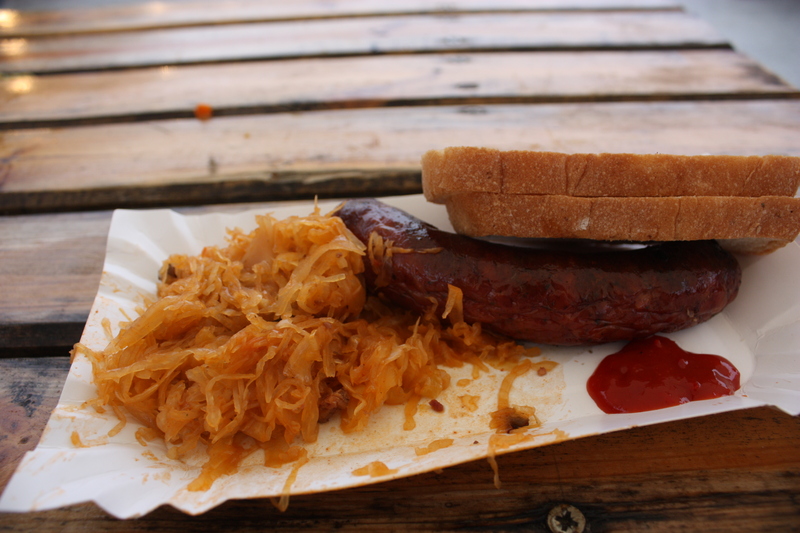 I soon realised that although I just loved the sausage – I was still not a big fan of bigos. Sorry Dad, but I did try. You always taught us that we couldn’t ever say we didn’t like something without trying it first. The rye bread had a fantastic taste though a little dry in texture – oh no, no butter!!! I gave the meal my best shot but pushed the bigos around the plate trying to disguise the fact that I didn’t like it. I didn’t want to look like a ‘french poodle’. Spying Ket in the crowd, I waved (and called) to attract her attention thinking that she might like to sample the bigos. She didn’t see me, so I got up and took a few steps toward her. When I turned back to show her ‘what I’d kept for her’ my place at the table had already been taken – and my plate! Quick as a flash - he must've been watching me! This entry was posted in Travel on August 9, 2010 by Rossi. 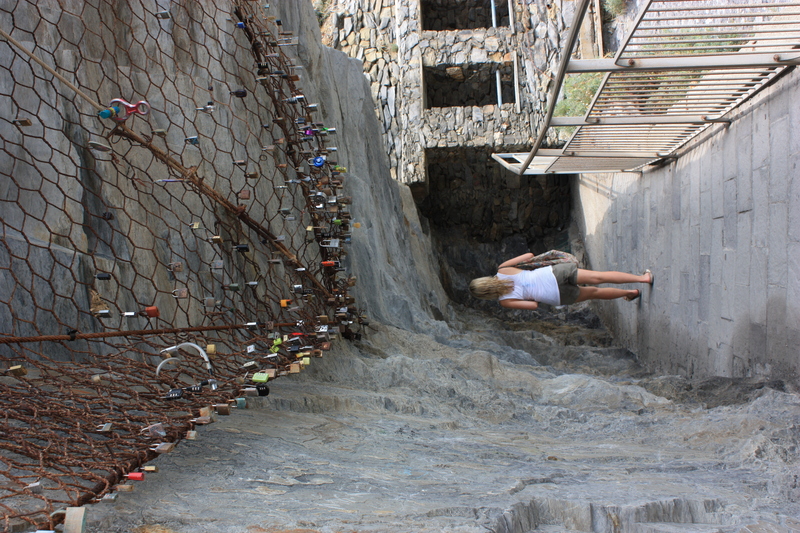 In New Zealand we have bras and knickers (not together) dangling from roadside fences and footwear hanging perilously from power lines – on the Cinque Terre walk (a drop-dead-gorgeous coastal hike), between Manarola and Riomaggiore, young couples seal their love by attaching a lock on any bit of fencing over about a 500m stretch. Some portions of the fence are thick with locks, others have plenty of breathing space between each. Many are labelled with the names of the lovers … the belief goes that attaching your lock to fence will guarantee you enduring love. Your love is sealed. You have to be organised to do this. You have to go prepared and with intent. 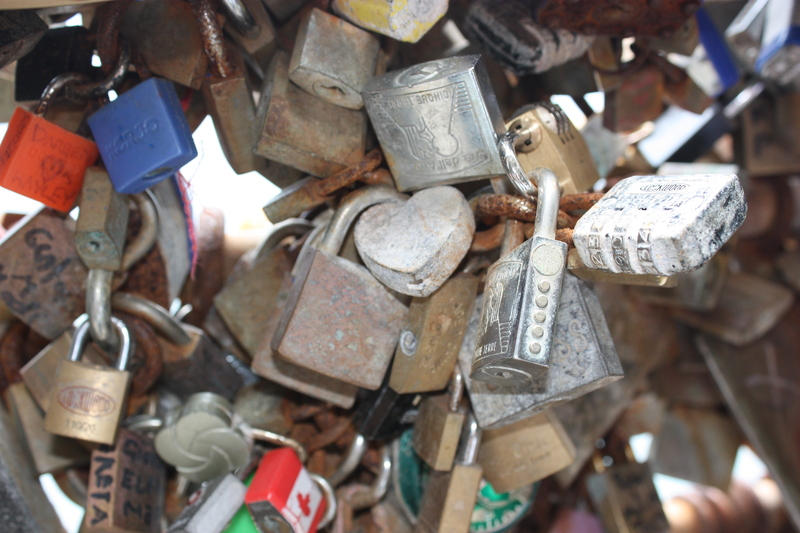 Most locks are, I suspect, from locals – others are undoubtedly from young tourists familiar with the belief. There were thousands of them, some hanging in such dense bundles that you would have needed very strong fingers to negotiate a space for the D ring. And some looked incredibly old – been hanging there for years, maybe even centuries! I’m waiting for this to catch on in New Zealand. Where could we do it? It can’t be somewhere that’s too easy to get to…got to make some sort of effort. Somewhere along the Hump Ridge Track could be good – that would show dedication for sure. And undying love. There could even be a charge for attaching your lock to a rope slung between trees…think money-making venture. Better start writing a business plan. This entry was posted in Travel, Uncategorized on August 6, 2010 by Rossi.